ArchiveAssist and ArchiveAssistXpress each allow the user to change the Modified Date of email messages in Outlook. 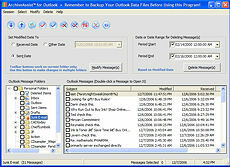 ArchiveAssist, however, is a full featured program allowing far more options to the user, including the ability to delete messages by date or by a range of dates in a single folder or across multiple folders (an operation which requires approximately ten steps in Outlook); the ability to change the Modified Date to a user specified date as opposed to only to the Received Date; the ability to change the Modified Date of messages in a single folder or across multiple folders; and the ability to view messages when the user needs more information to decide if a message should be archived or deleted. As ArchiveAssistXpress can only process messages one folder at a time, it would be most suitable for low volume users who have few folders and who don't need the flexibility and features of ArchiveAssist.